A key part of what transformed Davos from a place where third-rate ministers from second-rate countries gathered with a crowd of largely European business executives to a place where major political leaders flocked to be with a truly global business elite was the very real tie that was forged with Nelson Mandela in the 1990s. 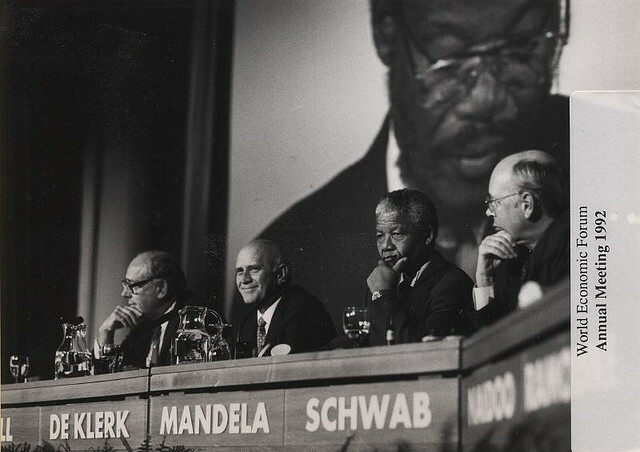 There are two wonderful stories from when Mandela first came to Davos in 1992, less than two years after he was freed from prison. Public figures entered the Kongresszentrum in Davos through a side, lower entrance, rather than the main entrance on Promenade. The entrance to the building’s kitchens was right near this VIP entrance, and when Mandela first entered the building and walked past the kitchens, the sliding doors sprang open. Unlike countless hundreds of other public figures before and after him, Mandela didn’t just walk by. Instead, he plunged into the kitchens, shaking the hand of every one of the workers. Personal postscript: Many of my best memories of ten years with the World Economic Forum are of South Africa, newly liberated and in economic transition. Largely through the efforts of Fred Sicre, who was in charge of Africa and the Middle East for WEF in those years, the Forum developed an amazing South African connection. Through my work with the Forum I met loads of powerful and remarkable people (the two sets are definitely not congruent). The only person I wished I had a photo of with me is Mandela. It would be like having a photo of yourself with Abe Lincoln. I blew it, in this case. At some point in the late ’90s, I was having dinner in New York with a friend from university shortly after I had returned from a South African trip. We ran into another friend, who was also a journalist, who mentioned he’d just been in South Africa. “Oh,” I said, “what were you doing there?” “I’ve been spending the last several months with Mandela, helping him write his autobiography,” he said. Richard Stengel didn’t say that as a boast, but it remains the greatest example of one upmanship I’ve ever encountered. * To my mind, inviting Li, still fresh in the memory as the butcher of Tienanmen Square, was a terrible thing for the World Economic Forum to do at the time. But it certainly helped the institution in its relationship with China. This entry was posted in Davos on December 6, 2013 by lance.